The Federal government of Pakistan has decided to launch a Youth Skills Development Scheme for the young males and females. This Skills development Scheme is being launched as a part of Prime Minister Youth Programs as well. 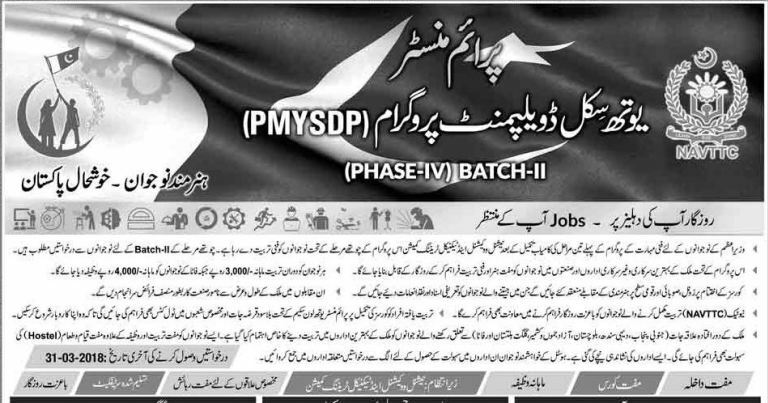 The basic purpose of introducing this scheme is to provide training and professional experience to unemployed youth in the country so that they can avail better employment opportunities.Prime Minister Youth Skills Development Program Scheme 2018 Batch-II Phase-IV Eligibility, geographical spread, procedure and last date to apply is being dispatched over here. The announced duration of this Youth Skills Development Scheme is 6 months during which the candidates will be given training in various fields like wood work, welding, electrician etc. After completing this training program, candidates will be able to seek job opportunities nationwide as well as abroad. The scheme will be launched nationwide and managing the expenditures, a budget of Rs. 800 Million has been allocated for the scheme. Total estimated 50,000 individuals will benefit from it who will receive a Rs. 3000 stipend on monthly basis for the training duration of six months.This scheme is also for FATA students from which they would get amount of Rs.4000/- per month. The key points about Prime Minister’s Youth Skills Development Program Scheme 2018 are mentioned below. All young men/women, Pakistani citizens with a valid CNIC. Age 16 – 36 Years. Entrepreneurial potential. NAVTEC shall not be responsible for TA/DA. Candidate can download application form from here online as link is being given below and applications must have to be submitted to their concerned district Navttc offices respectively. Deadline for the submission of application form is 31st March,2018.To get more information about interview,shortlisted candidates for selection keep in touch with us respectively. where is that application form? ?